Travelling to Bhutan, one will witness the importance people attach to Buddhism. Travelers first guide to Bhutan follows a tourism policy known as High Value, Low Impact. Travelling to Bhutan makes it all the more worthwhile in today’s time. Therefore, all tourists, except for those from India and Bangladesh are required to pay a tariff of USD 200 to 250 a day depending on the season. Before travelling to Bhutan, it is important to ensure you have everything sorted out regarding visa requirement, travel insurance and your itinerary either with your local travel agent or your Bhutanese partner. There is no visa on arrival in Bhutan. Check for events and festival before deciding on travelling to Bhutan. The best season to travel to Bhutan is during spring and fall where most of the local festivals take place. During this season, tourists have to pay a tariff of USD 250. The famous Thimphu Tshechu, the festival of colorful mask dance is held between September and October every year. The tiny Himalayan kingdom of Bhutan remained isolated in the lofty mountains of the Himalayas for centuries, completely cut off from the rest of the world. In the ancient times, the remote kingdom was an abode of meditation for many great Indian and Tibetan practitioners of Buddhism. Today, Bhutan is considered the last of the Himalayan Buddhist Kingdom. The elusive kingdom built its first road in the 1960s and officially opened the country for tourists a decade later. Its people were introduced to television only in the 1990s. Few countries in the world would offer what Bhutan can in terms of a variety of reasons. 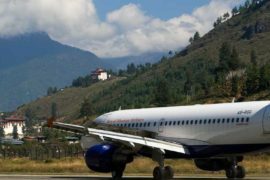 A trip by air to Bhutan will land you to Paro where Bhutan’s only International Airport is located. 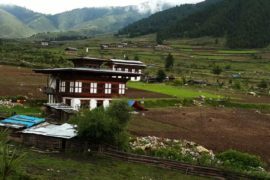 As soon as you arrive to Bhutan, one is treated to a sight of quaint temples, prayer flags and traditional Bhutanese homes. Buddhism is the principle religion in Bhutan. Like all ancient civilizations, people living in Bhutan practiced bonism in ancient times. They fierce deities both out of fear and devotion. 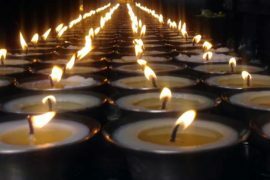 Although the practice of Buddhism existed in small numbers, a wave of transformation happened during the visit of Guru Padmasambhava in the eighth century. Padmasambhava was a tantric Indian saint, whose mission was to drive out evil spirits that plagued the region and convert them to protective deities of Buddhism. Padmasambhava is regarded as the second Buddha and Bhutan’s history is replete with his amazing powers and miracles. In the 17th century, Zhabdrung Ngawang Namgyel unified Bhutan under one system of government which he called the dual system. This system still exists today with the Je khenpo or the chief abbot as the Spiritual head and the King as the secular head. Religion and culture in Bhutan are almost inseparable. Culture is valued so much that it is almost treated with utmost devotion as religion. A tourist travelling to Bhutan will notice how Bhutan’s culture and religion come alive together in the famous festival of mask dances. Tshechus are the only place where one will be able to witness the culture and religion of Bhutan come alive in its entirety. Monks and laymen adorn themselves with masks and beautiful costumes to entertain audiences. People from all walks of life come together, wear their favorite dresses, the beautiful hand woven Gho and Kira to witness the festival. The famous Thimphu Tshechu is held every year between September and October. Over 5,000 tourists travel to Bhutan every year to witness the Thimphu Tshechu. The meaning and significance of the festival echo throughout Bhutan’s rich culture and religious history. Thousands of tourists travel to Bhutan every year to witness the festival. The Bhutanese people are a happy lot. More than 70 percent of the population depend on agriculture and live in close harmony with nature. The Bhutanese men wear the traditional dress called Gho, which resembles the Scottish kilt and women wear an ankle length garment called the Kira. Travelling across Bhutan, one will come across four major languages and several minor local dialects spoken in Bhutan. People living in the North and Western part of Bhutan speak the national language called Dzongkha. If you travel to the east and central Bhutan, people speak a language called Sharchopkha and Khengkha. In the South, about 30 percent of the Bhutanese speak Lhotsham or Nepali. After Bhutan opened up to the outside world in the 1960s, rapid development took place and people’s literacy level has also significantly increased. English is the second medium in all the schools in Bhutan. Most of the Bhutanese therefore are either well versed or understand English. Archery, the national game of Bhutan is the favorite past time for many Bhutanese. A traveler’s first introduction of Bhutan would most definitely be the famous Tiger’s Nest or the Paro Taktshang, an ancient Buddhist monastery precariously located on the face of a cliff. The monastery was built at a site where Guru Padmasambhava had mediated in the eighth century. A major attraction for tourists visiting Bhutan are the dzongs built by Zhabdrung Ngawang Namgyel in the 17th century as a fortress to defend Bhutan from invading Tibetans. These dzongs today serve as the administrative and religious centre. Almost each district in Bhutan has one dzong. The famous Punakha dzong, which is around 70 kilometers from Thimphu, is one of the favorite among many tourists. The dzong was of strategic importance to Bhutan and was the capital of Bhutan during the time of Zhabdrung. According to legends, Zhabdrung Ngawang Namgyel is said to have led the principal architect of the dzong to the paradise of Guru Padmasambhava and having instructed him to construct a dzong similar to what he saw in the paradise, the architect took to work and built the Punakha dzong. Therefore the dzong is considered as a replica of heaven on earth. A trip by air will land you to Bhutan’s only International airport at Paro. From Paro, it is a 45 minutes drive to the capital city of Thimphu following the Pachhu River. 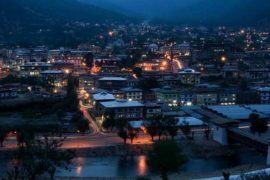 Both Paro and Thimphu carry a rich historical and religious legacy of Bhutan. 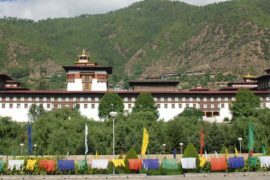 Thimphu, the capital city is houses the Royal Family of Bhutan. Upon reaching Bhutan, one can plan on a variety of trips, treks and festivals that happen throughout the country. Bhutan boasts of having one of the best and exclusive trekking routes in the world.